The working theory about Aaron Rodgers — who is now signed with the Green Bay Packers until age 40 and has said he plans to play that long — is that he’ll have to cut back on the number of plays he attempts to make outside the pocket and resort to a heavier diet of quick passes as he ages, much as Tom Brady has done. The 34-year-old Rodgers played that way on Sunday not because of his age, but because of the bulky brace he wore on his sprained left knee. If what the Vikings saw Sunday was a preview of what they’ll get from Rodgers in future years, it represented a stark difference from what they’re used to seeing. According to Pro Football Focus, Rodgers took an average of just 2.24 seconds before throwing on Sunday, down from his 2.65-second average in Week 1 and his 2.55-second average last year. He completed 21 of his 23 passes when he released the ball in 2.5 seconds or less, posting a passer rating of 105.4 on those throws. It seemed likely the Packers would resort to quicker throws against the Vikings on Sunday, to help Rodgers protect his knee, and he was sacked only once in the first half. 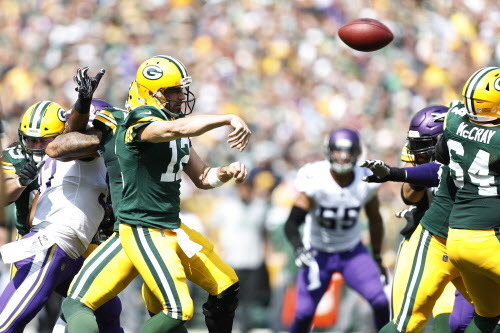 Even though the Vikings got to him three times in the second half, Rodgers found room to throw when he was blitzed. According to ESPN Stats and Information, Rodgers was 9 of 9 for 87 yards when he was blitzed on Sunday (though the Vikings did sack him to end the Packers’ lone overtime drive on a blitz from Mackensie Alexander). The Vikings’ front four had more success in the second half, as Everson Griffen and Danielle Hunter shared a third-quarter sack and Sheldon Richardson (who finished with a half-sack and three QB hits) started to get through the line. Stephen Weatherly also got a third-quarter shot on Rodgers on a 2nd-and-4. Overall, though, it’s worth noting that the Vikings had to bring extra heat after Rodgers in the second half, and how effective he was when they did. Things figure to get easier next week at home, against rookie Josh Allen and the Buffalo Bills. –In an odd sequence at the end of the first half, Rodgers completed an eight-yard pass to Adams and turned back toward referee Tony Corrente to signal timeout. The problem was, though, that the Packers had already spent their final timeout of the first half, which meant Rodgers was trying to call a timeout he didn’t have. The quarterback ran to the line just in time to snap the ball and hit Adams again, setting up a Mason Crosby field goal after Adams got out of bounds. The NFL changed its rulebook in 2016 to “make it a delay of game foul when a team attempts to call a timeout and it is not permitted to do so,” which meant Rodgers should have been flagged on Sunday (though a flag would have stopped the clock, at least momentarily). 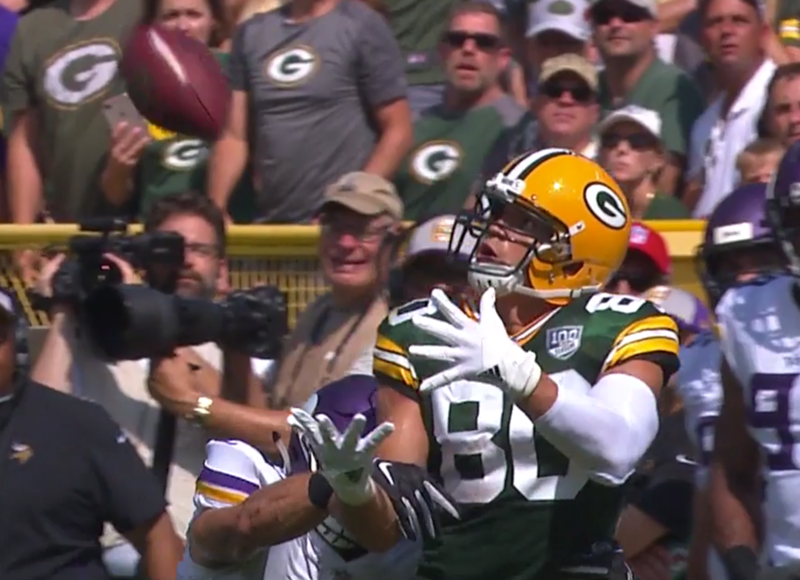 In any case, the penalty wasn’t called, and after Rodgers’ completion to Adams put the Packers at the Vikings’ 19, Crosby hit a 37-yard field goal to end the first half. –Linebacker Ben Gedeon made one of the Vikings’ biggest defensive plays of the day on Sunday, running step-for-step with Jimmy Graham as Rodgers tried to hit him on a deep ball down the left sideline in the first half. Rodgers’ throw went off Graham’s left hand, and if Graham had been a step ahead, he might have caught the pass in stride for a touchdown. As it was, Gedeon appeared to hook his right arm on Graham’s right hand a split-second early, drawing the ire of the Lambeau Field crowd once it saw a replay. At full speed, though, it was the kind of subtle move that wasn’t going to draw a penalty, and by keeping pace with Graham, Gedeon made what might have been one of the biggest plays of the game. –Stefon Diggs’ second touchdown on Sunday — a 75-yard fourth-quarter bomb from Kirk Cousins to pull the Vikings within two — was the most explosive play of the game by either team, but his first score of the day was the product of a clever play design from offensive coordinator John DeFilippo. Diggs motioned in from a three-receiver set to the right of Kirk Cousins, with Tramon Williams following him. The receiver broke back to the right, then cut back to the left, sprinting toward the left sideline as Cousins snapped the ball. His motion helped him beat Williams to the corner, and he caught a three-yard scoring pass from Cousins to pull the Vikings within six in the fourth quarter. Diggs’ motion on the play looked like the short shuttle drill players do at the NFL scouting combine, and the Vikings essentially bet that he’d make a better cut than the 35-year-old Williams in man coverage. They were right. –After right tackle Rashod Hill left the game with an ankle injury, second-round pick Brian O’Neill entered the game and appeared to turn in a solid debut. According to Pro Football Focus, O’Neill allowed only one hurry in 25 pass-blocking snaps, as the Vikings rallied to tie the game. It’s worth noting that the rookie’s work came when the Vikings were throwing on almost every play, which might have simplified things for O’Neill somewhat. But the Vikings felt good enough about O’Neill to keep Mike Remmers at right guard, rather than sliding him out to tackle and putting Danny Isidora at right guard. It’s worth watching how the Vikings use O’Neill going forward, especially if Hill’s ankle becomes a concern.